The Importance of Accepting Personal Responsibility. Why we need to own up to our mistakes, even if they were unintentional. I was recently reading my newspaper’s opinion section when I came across a submission that caught my attention. This person (an adult woman) wrote in complaining because her mom had parked on the road illegally and had gotten a ticket for it. In my entire valley, it is illegal to park on the street between November and March due to snow-removal needs. The writer said a few things. One was that she and her husband “forgot” about the law, and later in the piece said that despite living here for ten years, they had never even heard about the law. She also commented that information about the law had been printed in the city newsletter sent to every home in the city a couple of times just this year, but that she doesn’t always read those so she didn’t know. It was also printed in the newspaper, but she missed that. The city explained the ticket could be appealed, but the woman was leaving town and decided she couldn’t, for whatever reason, come back to appeal. The writer then complained that the city should put street signs up around the city to warn people of the parking law. I was really in shock over this letter. Here we have an adult woman complaining about a law in a city she has lived in for ten years and has either forgotten about or never did hear about (not sure which). She then claims street signs would do the trick, but I am not sure how often a sign would have to be posted for her to have seen it. Do they need a sign in front of every single house? (and if it was, I wonder if she would complain about the unsightly sign in front of her house). I am of the opinion that we have a responsibility to be aware of the laws. We are all grown adults; we don’t need someone to come knock at our front door and explain each law we are required to follow. I, myself, moved to this valley 11 years ago and knew about the law to not park on the road overnight within two months of moving here. Contrast this woman’s letter with a friend of mine who at the same time, got a ticket for the same thing. Was she frustrated? Yes. Did she blame everyone other than herself? No. Can’t you just see someone walking under a coconut tree, getting knocked in the head, and then suing whoever owned that coconut tree for negligence? If we get pulled over for speeding, it is “that jerk cop’s” fault and not our own (a sentiment I disagree with–it is your fault for speeding. Sorry. I agree that speed traps are annoying, but if you aren’t speeding, then you won’t get “trapped.” If you are speeding, then getting pulled over was a risk you took when you decided to go faster than the posted speed limit). 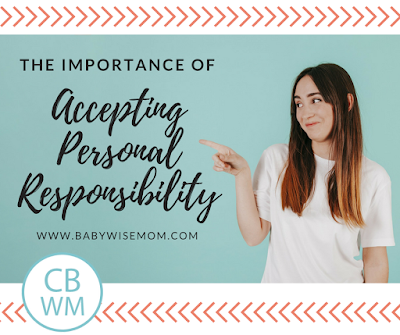 Why is personal responsibility something important for us to be willing to accept as parents? Because we expect it from our children. Usually. In our home, we expect the child to accept the consequences for their actions. We want them to be honest and forthright in their actions. 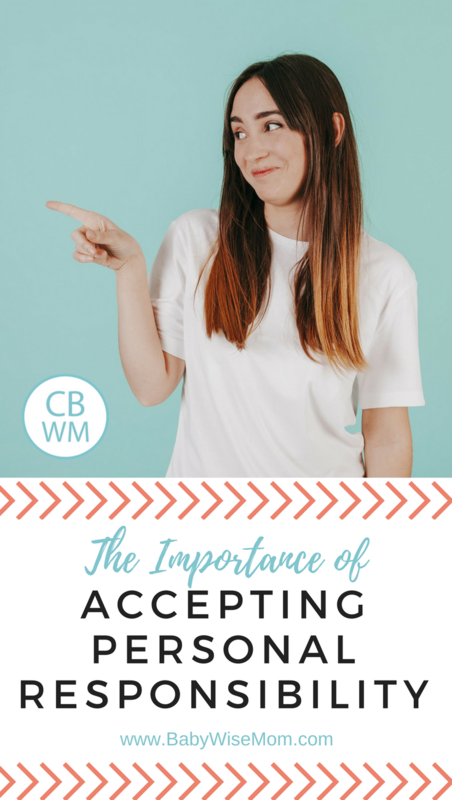 Keep this in mind the next time you are faced with accepting responsibility for an action. Keep the same standards for yourself that you hope for your children (and everyone else’s children). Example is a powerful teacher. Always remember the line, “Your actions speak so loudly that I cannot hear what you are saying.” Your child’s number one teacher of morals is none other than you–and it is through your actions, not your lessons. Next Post No Use Crying Over Spilled Milk…Or Is There? This has nothing to do with your post, but I have a question and read that this is how I can post a question.I have a 5 month old girl and we are currently at my parent's house, which is on central time, for a week and a half. We live in the eastern time zone. Do I try to switch my baby's schedule to central time or keep her eastern time schedule and accept it. Example: her regular schedule at our house (eastern time)6:30/10:00/1:00/4:00/7:00/9:30so on central time she's waking up at 5:30. Should I try to adjust her or not.We are in day 3 of 11 of staying with my parents.Any thoughts are appreciated! Thank you Megan! That is very sweet of you! Moni, sorry this is not helpful to you now. When I travel one time zone, I don't switch out of our normal time. It is too much work to move back and forth. If it is a two hour time difference or greater, it might be worth changing.